Were you expecting the mini-series based on Stephen King’s novel of the same name? Don’t worry, that DVD box is also available to watch in our viewing room on 4F. Chai Jing felt she had to live under a dome in Beijing, inspired by King’s story. She trained as a reporter, the skills you are learning at university. She asked questions about her daily life. 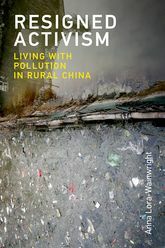 In 2017, Anna Lora-Wainwright wrote a similar perspective for MIT Press: Resigned Activism: Living with Pollution in Rural China (on the shelf in the library at TD187.5.C6 L67 2017). What questions do you have? Deep thinking or Critical thinking takes time. It evolves slowly rather than in 2-4 hours of writing a term paper. Critical thinking builds upon skills librarians call information literacy. There are six; let’s focus on two, Reseach is Inquiry and Scholarship is Conversation. Chai Jing had a question about the air quality in Beijing. She began conversations with businesses, educators, and government officials. These conversations led to introductions, recommendations, and more questions. Some conversations were with written documents, whether news articles, research documents, or government publications. Others were in person or by phone. For example, Matthew Kahne and Siqi Zheng wrote their research in 2017: Blue Skies over Beijing: Economic Growth and Environment in China by Princeton University Press. In creating her documentary, she pursued, analyzed, and synthesized information, whether as data, reports, or proclamations. The research process includes identifying which problem or population (government body, event, chemical, animal, or person) you are interested in. It is usually a noun that answers, “Who?” The research process identifies an intervention or indicator which might be a specific moment, event, measurement, or process that affects the problem or population. These two questions yield terms to search in a database or library for encyclopedias or introductions to the history and experts about them. For Chai Jing, these may have been herself/her family and air quality in Beijing. Some are inspired to act, such as David Pellow, in his 2007 book for MIT Press, Resisting Global Toxics: Transnational Movements for Environmental Justice. As research continues, you may identify an outcome, specific time, or comparison to add to your search box to narrow the focus of your paper. Adding these questions too early may limit your results. For Chai Jing, these included when and how energy production occurs in China, the surgery to remove lumps from a lung, or how she remembers seeing the sun, blue sky, and stars years before. Had she begun by searching “sun and stars Beijing” or “lung cancer Beijing”, she might have missed the bigger context of government regulations and energy production across northern China. Whether you find yourself at the early or later stages of your research journey, the librarians are available to chat, even on WeChat, or in person, and by email.